I think I can safely say that I was born into illustration. My mom was an illustrator doing work for Cosmo, Vogue, Good Housekeeping, Bloomingdales etc. I was always posing for her polaroid reference shots (ah… the good old 80’s). A make-up how to, a fashion spread, a children’s book, you name it. She worked in colored pencil, pastel, and watercolor mostly. My ideal day as a kid was to wake up go to my hand-me-down drawing table and just draw all day. 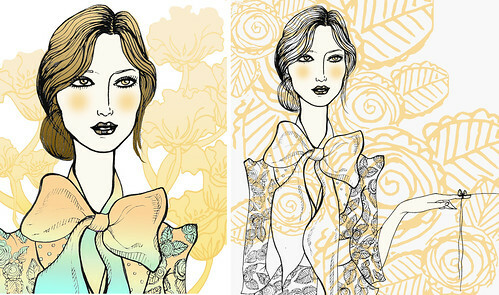 I drew fashion girls that looked like Katy Keene, princesses, narratives, etc. So When I majored in illustration, no one was surprised. I loved working the way I did in college, I learned so much but the work was not intrinsically me. So I moved away from it toward painting thinking that that would be better for me. But somehow I never felt totally comfortable working like that either. So now, years later I’m returning to my childhood roots and working the way I love. I’m currently putting together a portfolio and website and just finished a slew of illustrations for fashion designer/ blogger Mary Jo Matsumoto that she’ll be posting on her site soon. I’m working on the illustration above, playing with background, color, and cropping. More later. I love these. Looking forward to seeing your work for Mary Jo Matsumoto. these illustrations are amazing, sammy! beautiful. We just finished looking at your new blog and we loved the pictures of you and the story of how you modeled for your Mom. The new illustration is beautiful and we look forward to seeing more. Love to David and you! Thanks nana and aunt Irene! I love when the family reads my blog! Miss you all.